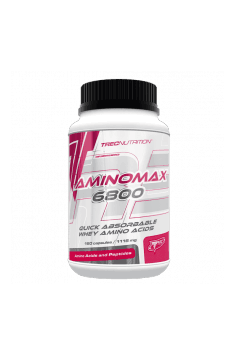 AMINOMAX 6800 is designed to quickly replenish amino acid deficiency, a condition which occurs after an intense workout or as a result of insufficient protein intake. AMINOMAX 6800 contains a composition of amino acids and micropeptides derived from whey protein concentrate hydrolysate with a considerable addition of pure L-Glutamine and Taurine, all of which contribute to its ideal aminogram. AMINOMAX 6800 is also enhanced with Vitamin C and Vitamin B6, thanks to which amino acids are used more efficiently in the body. Take 8 capsules immediately after training. Take 4 capsules 2 times a day 30 minutes before a meal. The supplement aims at quickly supplying amino acids after intensive workout. Taking on non-training days is not necessary. Hydrolyzed Whey Protein Concentrate (from milk) (81,4%), capsule shell (gelatine; dyes - titanium dioxide, patent blue V), anti-caking agent (Magnesium salts of fatty acids).